One day, the disciples threw their nets into the water, but they couldn’t catch any fish. (The teenagers should be sitting in an aisle casting imaginary nets.) Let the children know the disciples kept trying and trying. There were still no fish in the nets. Tell them that Jesus could see the disciples from where he stood on the shore, and so he told them to throw the nets to the other side of the boat. Ask the children to shout “Other side!” with you on the count of three. When the children do this, have the teenagers turn and start casting their nets on the other side of the aisle. Next, tell the children that the disciples caught a lot of fish when they listened to Jesus, so they brought their boat back to shore. (The fishing teens should join the children at the front of the church.) The disciples came and sat at a fire with Jesus, and he cooked breakfast for them. Pull out the skillet and pretend to cook breakfast. Show the children the fish cutouts. Tell the group that as they sat there, Jesus kept asking Peter if Peter loved him. Ask the children if they love Jesus. Help them understand that Jesus asked Peter this question three times because, on the day Jesus was killed, Peter said three times that he didn’t know who Jesus was. Let the children know that after Jesus asked Peter this question, he told Peter to feed his sheep. Explain that by “sheep,” Jesus meant people. He wanted Peter to feed and take care of people just as Jesus had. 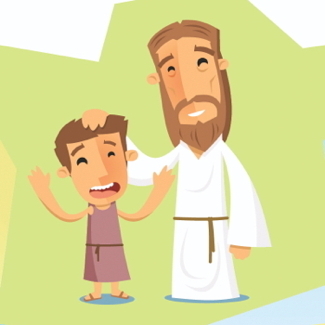 Remind the children that Jesus forgave Peter and even gave him an important job because he loved Peter just as Jesus loves us. Close with a prayer asking Jesus to help us forgive others and to lead us to feed God’s sheep just as Peter did. This post originally appeared in Live the Stories: 50 Interactive Children’s Sermons.